Timed with the release of the new 2010 Hong Kong Collection by OPI, the Dell Design Studio now offers six of the collection’s shades. The OPI by Dell line was originally launched in November 2009, and the Dell Design Studio is replacing the initial Holiday Collection selections with the new Hong Kong Collection options. There are also 20 classic OPI colors in the permanent collection of color choices for Mini, Inspiron and Studio laptops. The Hong Kong Collection features fun shades in deep orange, jade green, red, berry, purple, and blue. 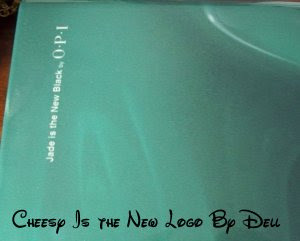 Just hearing that Jade is the New Black was one of the OPI by Dell colors had me thinking that now was the time to buy a Studio 17 notebook. I imagined getting it for my birthday at the end of March, which coincides with when I usually get a Federal tax refund. However, Mercury being in retrograde and all, my printer broke on a Saturday and my 8-year old Dell tower refused to boot up the following Monday. The time was right to order the new laptop and printer now. I momentarily thought about ordering the shell in I'm Not Really a Waitress because it is such a fun and classic shade of red. I love the shimmer. But, I went with Jade Is the New Black sight unseen. I'd seen some swatches of the nail lacquer online, and it really did look like a kelly green jade stone or a green onyx. That would make a lovely laptop color. I'd already named my new techno-baby "The Green Machine" and committed to painting my nails with the lucky looking OPI's Jade Is the New Black until my new computer arrived. Unfortunately, it took a long time for my new techno-baby to get here. The gestation period amounted to about 3 weeks, which is an eternity when you are sans home computer. And then I was at the office during the first delivery attempt and it pained me to have to wait another day. I am not sure what I was more excited about, switching to one of my new Alice In Wonderland holographic OPIs once I got the laptop or the laptop itself. Three weeks is much longer than I like to go with any one nail color, despite how much I do love this shade of green and that it looks good with about 70% of my wardrobe being kelly green, navy, or black. So, imagine my surprise when I cracked open the box for my new techno-baby and saw what essentially looked like a Shamrock shake swirl on the top. It's much lighter than the polish, and it's a very grainy image. In fact, in the upper-left corner, there is "OPI by Dell Jade is the New Black" in print, and the font looks grainy too. BIG LET DOWN. The more I look at it, the more it reminds me of that faux green marble finish that was so popular to paint on the walls in the 1990s. I can't even say that it looks like malachite instead of jade. It looks like a vanilla shake getting mixed with some horrid green mint gel at the local malt shop. It's that white veining that makes my stomach churn. This designer shell was a total waste of $85. I still love the machine with it backlit keyboard, web cam, and extra RAM. It's the "designer" OPI by Dell shell that I could have lived without. I don't even think a vinyl design from etsy.com could save this shell. It would just be contributing to the wrongness to add another layer. It's a good thing I don't have to look at the shell when I am actually using the notebook. When I posted my disappointment about the color of the shell on Facebook, I got a comment from a friend who said she was disappointed with the Princesses Rule! one that she got. For those who aren't familiar with that color, it's a pink microglitter. Instead of having a glittery or metallic sheen, she said there are white blobs where the glitter is supposed to be. WTF? The flinish of these shades is what makes them unique to OPI. Merely putting a "wet paint" look of a small swatch magnified to 400% and drowning down these glorious hues dismays this nailphile. If you are interested in ordering a designer shell for your new computer, I suggest trying to find photos or video of the actual product online first. QVC.com has some of the classic colors. The Hong Kong Collection color options are available now for $85 per device. All customizable colors for Dell Mini, Inspiron and Studio laptops are available at www.dell.com/DesignStudio. The newest additions will be retailed first in the U.S. and later in other countries. Select OPI colors will also be available at select Dell retailers nationwide. Anyway, for a person who has short attention span,I might get sick of any custom color within a month. I'll stick with my Macbook Air. As someone who has been in the PC world for longer than I would like to admit, when I first saw Dell was teaming with OPI I had a bad feeling in the pit of my stomach. I knew this would not work. The greatest marketing scheme since Coke came out with the bad tasting new Coke then brought back the Classic Coke. This is just another reason why I would NEVER buy a Dell. What a way to get women to buy their product! Get them at their weakest point - nail polish. It's practically impossible to franken a polish when it's discontinued - did they really think they could do it without actually PAINTING the color on the PC? Does anyone over there truly care that the colors are not true? Where is your quality control? Where is OPI in all this? Aren't they interested in the fact that they are being misrepresented? Shame on you Dell for such a devious plot. Shame on you Dell for not being on top of this. Shame on you Dell for selling an inferior product. Shame on you Dell for deceiving an entire portion of the population into buying something that doesn't really exist. Shame on you Dell for cleaning up on this scam. Shame, shame, shame. Oh god!! I ordered one for christmas in a red glittery shade, and I cried when I opened the box. The color was awfull, grainy and a bad printing job. I repackaged it, and returned it the very same day. I was unbelievably unimpressed! 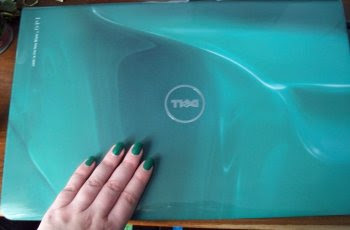 No way would I ever buy a Dell, but on my screen at least, that actually is a really nice colour. Screens can be *very* deceiving though. And, perhaps more to the point, it definitely isn't the same colour as your nail polish, so that's a fail for sure. I'm sorry you're disappointed with it, but at least you like the machine itself. i prefer this over that famous Chanel Jade from your NOTD. it's more mysterious in a way. oh my god a serious LOL @ this: "she said there are white blobs where the glitter is supposed to be. WTF?" I got caught out the same way. 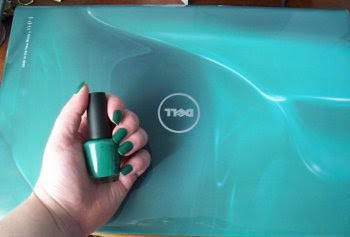 I'm not someone who wears lot of coloured nail polish, but loved the design and idea of a glossy, laquered laptop in some great colours. I ordered Louvre Me, Louvre Me Not - described as (and looking like)"Royal Purple". It arrived this morning and I nearly cried, it's a trashy, hot lipstick pink colour - nothing like purple! Not even a pinky, purply, "is it pink or is it purple" kind of colour - just a really nasty, light, bright pink. And the quality is awful as well, just looks like a poor, flat matt photocopy, you can clearly see horizontal lines across the finish, like it's been printed on a cheap inkjet printer. It's going back.